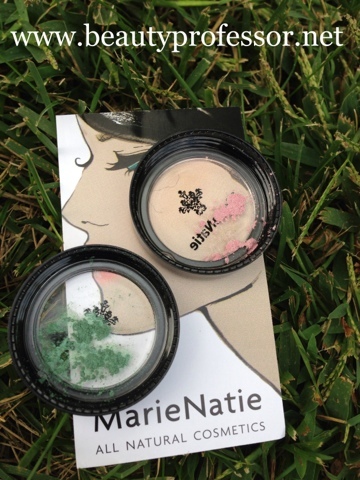 Above: Marie Natie loose eyeshadow in Rose and Emerald. 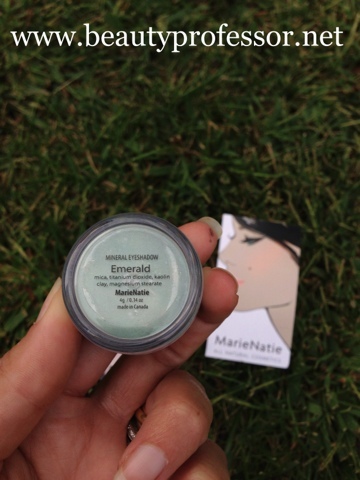 I recently had the opportunity to try two Loose Mineral Eyeshadows by the Canadian natural cosmetics brand, Marie Natie. The line, which is free of parabens, sulfates, synthetic fragrances, synthetic dyes, petro-chemicals and phthalates, embraces the notion that beautiful makeup can also be good for the skin. Although I tend to be a more neutral eyeshadow lover, the shades that I received challenge my comfort zone in a good way. The texture of the shadows, which retail for $15 Canadian Dollars, is silky and smooth...they are easy to work with, finely-milled and easily blendable (even without a primer), thereby reducing the potential for fall out and adding to their lasting power. Above: Housed in a plastic jar with a built-in sifter and screw on lid, Emerald is a vibrant jungle green. 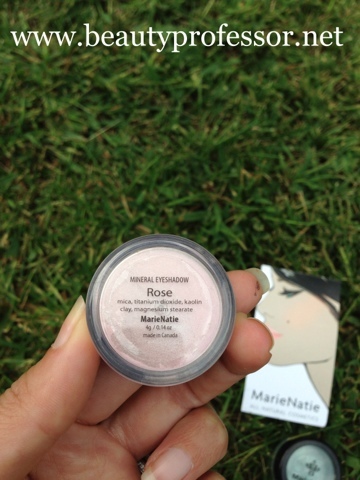 Above: Rose is a frosty, iridescent pale pink that can be used as shadow or highlighter, depending on the area of the face in which it is applied. Above: The loose shadows in their respective lids, pre-blending, to show their finely-milled texture and saturated color. The ingredients of these gems are simple: Titanium dioxide, magnesium stearate, ultra silk mica, sericite mica, kaolin clay, mica. 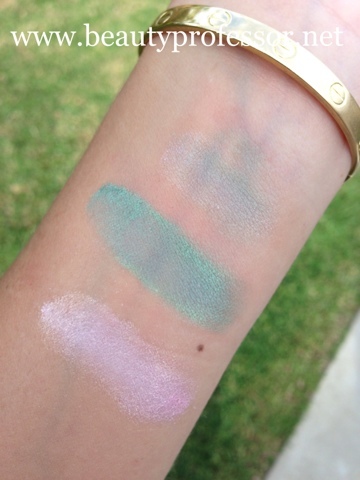 Above from bottom to top: Swatches of Marie Natie Rose and Emerald in direct sunlight. The light-generating qualities of these shadows is remarkable! 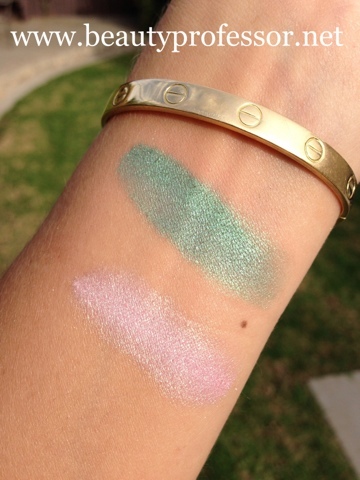 Above: Swatches of Rose and Emerald in the shade...even when out of the path of direct sunlight, these shadows are brilliant and rich. 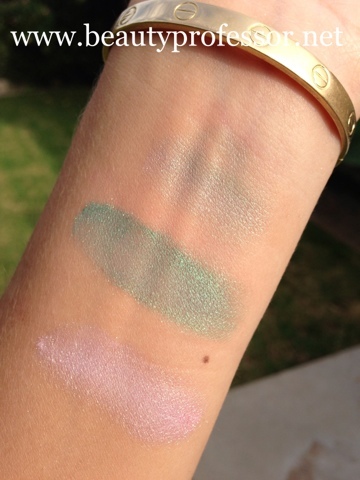 Above from bottom to top: swatches of Rose, Emerald and a combination of both Rose and Emerald layered together in direct sunlight = a radiant iridescent shade of rosy-tinged gray-green. 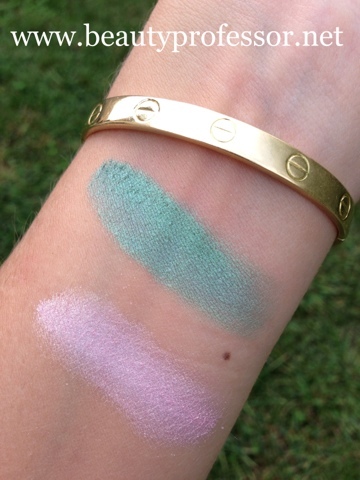 Above from bottom to top: swatches of Rose, Emerald and a combination of both Rose and Emerald layered together in the shade = a radiant iridescent shade of rosy-tinged gray-green. Bottom Line: I really appreciate what the Marie Natie line is trying to achieve. The products are all-natural and free of harmful ingredients, color saturated and long wearing. The shadows that I tried are simply brilliant (as exemplified by the images above)...while I may not wear Emerald on a daily basis, it is a wonderful color for more dramatic moments and the Rose shade is perfect for highlighting and adding a sheen to eyes, as well as to other areas where the face may catch light. 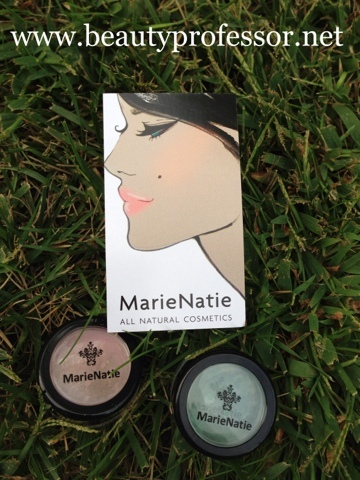 Marie Natie offers other shades of this luminous product as well...visit www.marienatie.com to explore all of the options! Have a wonderful week, Vicky!